Crunchyroll - Yen Press Licenses "KonoSuba" and "Death March to the Parallel World Rhapsody!" Yen Press Licenses "KonoSuba" and "Death March to the Parallel World Rhapsody!" 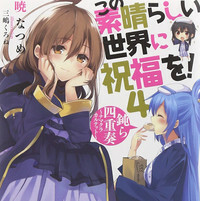 North American manga/light novel publisher Yen Press has announced the license of Jitakukeibihei (Natsume Akatsuki)'s KonoSuba: God's Blessing on This Wonderful World! light novel series, inspiration for last season's anime, and the fantasy series' manga adaptation by Masahito Watari. Joining this is Hiro Ainana's programmer-turned-fantasy-harem-hero series Death Marching to the Parallel World Rhapsody. Both titles are from Fujimi Shobou, an imprint of Kadokawa Corporation, who acquired majority ownership of Yen Press this spring. konosuba, death march to the parallel world rhapsody!